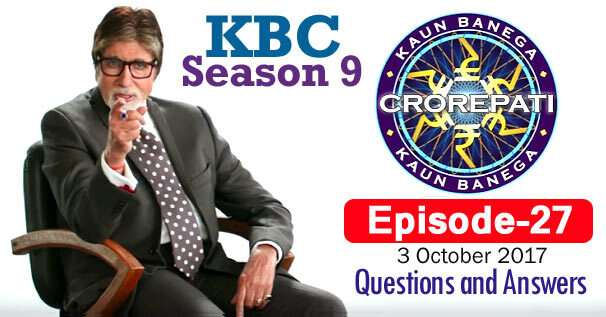 KBC Season 9 Episode 27 Questions and Answers: The twenty-seven episode of Season 9 of Kaun Banega Crorepati (KBC) was telecast on 3rd October 2017. In which Amitabh Bachchan had asked contestants 12 questions of General Knowledge. The correct answer to all the questions is given below each question. By reading these questions, you can prepare yourself for the next KBC Season 10 of Kaun Banega Crorepati. Because by reading these questions, you will understand what kind of questions asks Amitabh Bachchan in KBC. These all general knowledge questions will be helpful to for you various Competitive Examinations and Interviews besides KBC. Remember, the answer to some question may be in accordance with that time, while the answer to those question may differ according to the present time. 1. Which if these artists was principally entrusted with the task of 'illuminating' the original document of the constitution of India? 2. Which of the following is not a pair of parent and child, who have both won Nobel Prizes? 4. Which of these following is said to produce a 'Chham-Chham' sound? 5. Which of these function is used on both Twitter and Facebook to organise content? 6. Sunscreen lotion protects our skin against which rays? 7. How do we better know the character Pawan Kumar Chaturvedi played by Salman Khan in one of his films? 9. Which of the following actresses hails from Sri Lanka? 10. Which of the following did not complete it's 10th anniversary in 2017? 11. The Tropic of Cancer does not pass through which of these Indian states? 12. Which of these chief ministers has also worked as a handloom weaver in the early phase of his career?